Wow!! A post full of gorgeousness!! You should be incredibly proud Krissy of everything you created. It is all just stunning! I would have picked you for a master! YAAAAYYYY love your Masters entry Krissy! Thanks for the special mention of me you, you are too sweet :D :D I also got an email today from Cassie about a product challenge - I wonder if it's the same one?? Exciting huh? what stunning work Krissy - Congrats on the HM!!! congratulations krissy!! hopefully everyone can now recognise as much as we do, how fantastic you are!! you rock!!! Gorgeous gorgeous gorgeous work! I love all of your entries lovie!!! CONGRATS on the HM. I got my sub today and it LOOKS GREAT in there!!! 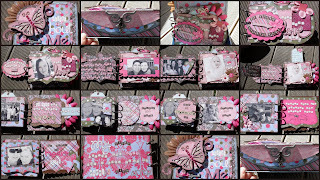 Hi Krissy, I just got my copy of Scrapbooking Masters. A huge Congrats on your honourable mention! Very well deserved! Gorgeous work chickie! Glad they picked your shaped LO, it was so pretty ;). ditto on the product challenge, I got one too :). Congrats on your HM and all of your awesome projects Krissy!